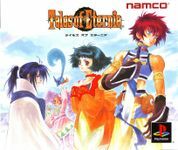 The third installment in Namco's "Tales of…" series, Eternia was called Tales of Destiny II in the West (due to Mattel's trademark on the name Eternia), which caused some confusion for the 2002 PS2 game Tales of Destiny 2. The player takes the role of a boy suddenly faced with a strange girl fallen from the sky, and he embarks on a journey that will eventually lead to the sky kingdom. In the fighting sequences, the games allowed for 4 players simultaneously controlling the characters. The game was later ported to the PSP. Characteristic Genre Name: "RPG of Eternity and Bonds"